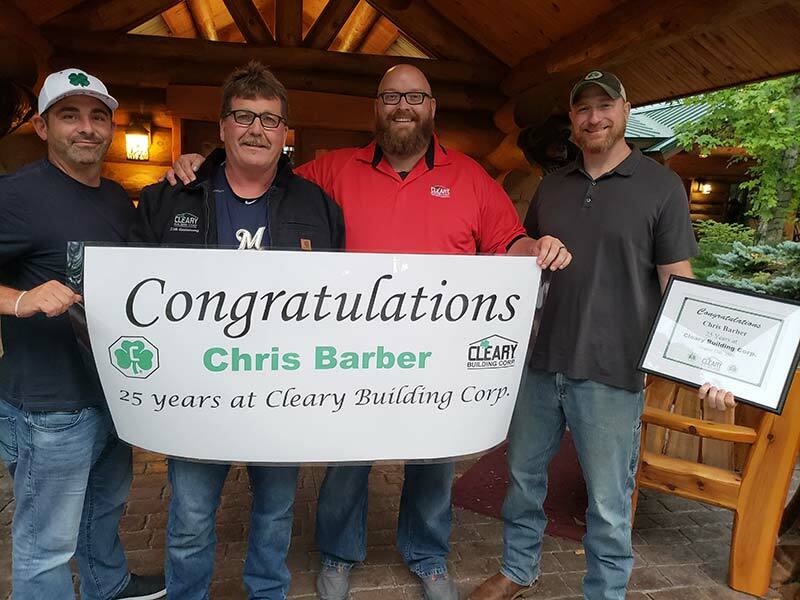 VERONA, WI – In appreciation for 25 years of service to Cleary Building Corp., Chris Barber, a Foreman out of Cleary’s office in Pulaski, WI, was recently recognized and presented with an anniversary certificate and a custom Cleary jacket. Over the course of his tenure at Cleary, Chris has made a valuable contribution to the growth and success of the company. Cleary Building Corp. would like to thank and congratulate Chris for his loyalty and dedication for the past 25 years. Chris lives in Schofield, WI. Pictured above, Chris Barber is presented with a 25-year anniversary certificate and a custom Cleary jacket. From left to right – Brian Ransom, General Manager of Operation, Chris Barber, Scott Goodell, Region Manager, and Pat Campbell, Branch Manager. Cleary Building Corp. is a family-owned company in business since 1978! The Corporate World Headquarters and area manufacturing facility are located in Verona, WI. Additional manufacturing facilities are located in Grand Island, NE and Hazelton, ID. Cleary Building Corp. employs over 800 full-time employees throughout the United States at 81 branch offices. For more information about Cleary Building Corp., contact us at (800) 373-5550, or visit ClearyBuilding.com. Hours of operation: 8 a.m. – 12 p.m.; 1 p.m. – 5 p.m. Monday through Friday, and 8 a.m. – 12 p.m. on Saturdays.